Extraordinarily lively and documented, in a style that takes on all [the author’s] enthusiasm and passion. A really beautiful tango book. During the presentation of The Pugliese Story at Steve & Debbie Morrall’s studio, I was asked a question I could not answer. The question arose when I was talking about Pugliese’s semi-retirement in 1957. 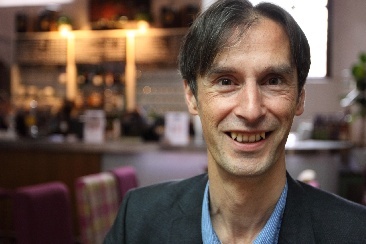 Osvaldo Manzi was hired as a replacement pianist. I showed a photograph of a publicity card from October 1957, in which Manzi’s image has been overprinted. A keen eyed audience member pointed out that Manzi’s picture was not the one overprinted: he is second from the left, and is named. What’s going on? Well, this second image comes from a publicity card from May 1958. Compare the two cards, and look whose picture was where Manzi’s is now: it’s that of Enrique Camerano, Pugliese’s first violin. It’s known that Camerano retired in 1958 for personal reasons, but the exact date was not known. (Oscar del Priore says November). It’s thought that Camerano played on the recording session of 23rd July, but this card suggests that in May he was already not playing in the band’s public performances. And the identity of the new man? It’s probably the cellist Adriano Fanelli. Camerano’s tone was so full and rich that the band managed without a cello as long as he was playing. (The viola players unfortunately were not famous enough to be included; perhaps they only played on the recordings). So, please keep those awkward questions coming – they’re really helpful. La versión castellano de “Tango Stories” está editado fuera de Argentina con ISBN 978-09573276-6-5. El libro está disponible en todos los sitios web amazon y en createspace. Les ofrecemes un código descuento en createspace, FG7T6VZB, lo que les da un descuento de 15%. Une corte critique de Histoires de tango dans le magazine de tango ToutTango. La version française de Tango Stories est disponible sur amazon.fr. D’accord, nous préférons que vous le commandez de nous. The French version of Tango Stories is now available on amazon.fr. Of course, we would prefer you to buy it from us. The French version of Tango Stories is here! The book will be presented in Paris on 31st January at Milonga Florida (the milonga of the Association Baïres de retour ). The book has gone to the printers and we are now accepting pre-orders. La version française de Tango Stories est ici! Il y aura une presentation à Milonga Florida de l’association Baïres de retour à Paris le 31 Janvier. Le livre a été envoyé à l’imprimerie et nous acceptons maintenant les pré-commandes. 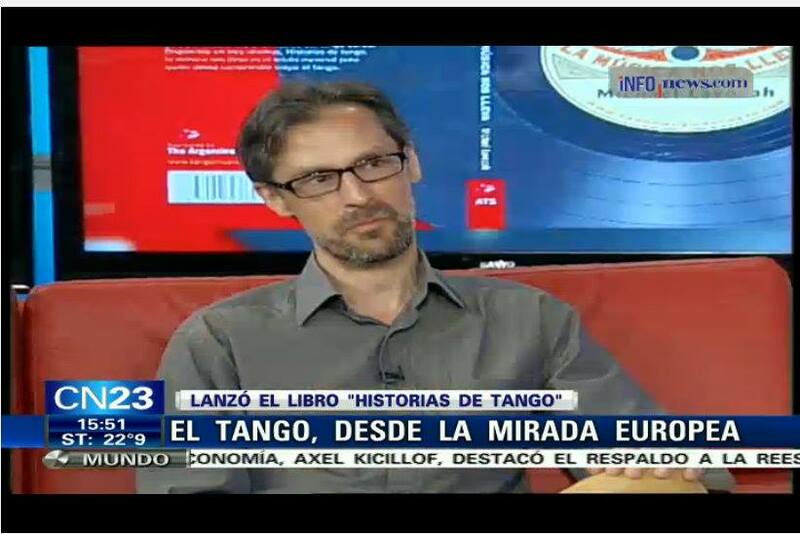 Historías de tango: la música nos lleva was recently presented at Buenos Aires’s Feria del Libro, one of the largest book fairs in the world. This presentation was made possible by the Argentine Tango Society (ATS), who also sponsored the translation. 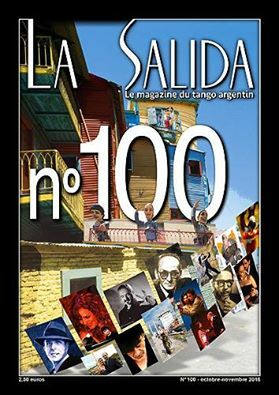 As I was unable to attend, the book was presented by the poet Bebe Ponti and Ricardo García Blaya, the man behind the website todotango, who was also presenting his new work “Tango Argentino: Memoria y Testimonio”. We were fortunate to have the presence of the wonderful dancers and teachers Gustavo Benzecry Saba & María Olivera, who danced for a delighted audience. I’m very grateful to the ATS for supporting my work and making this evening possible. 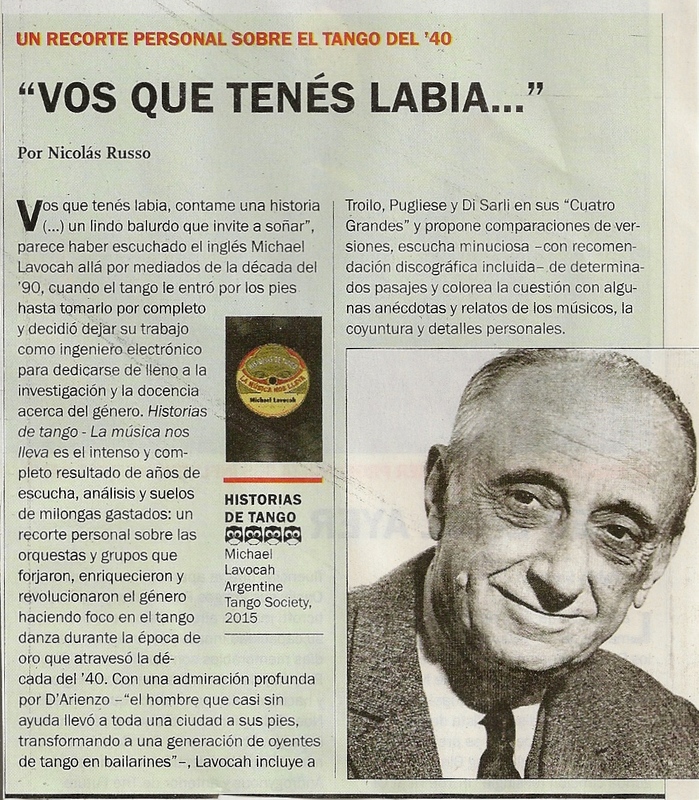 A new review of Historias de tango in the Argentine print magazine Revista Veintitrés. ‘Historias de tango – La música nos lleva’ es el intenso y completo resultado de años de escucha, análisis y suelos de milongas gastados: un recorte personal sobre las orquestas y grupos que forjaron, enriquecieron y revolucionaron el género haciendo foco en el tango danza durante la época de oro que atravesó la década del ’40. 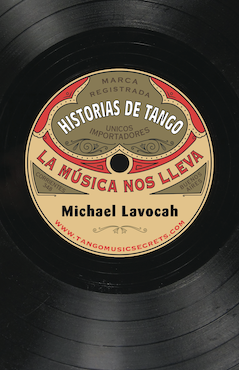 ‘Historias de tango – La música nos lleva’ is the intense and complete result of years of listening, analysis and worn-out milonga floors: a personal review of orchestras and groups which forged, enriched and revolutionised the genre, focussing on tango as a dance during the golden age that spanned the 40s. See the full review below. The opening quote in the review – You have who lips, tell me a story… a beautiful mess which invites one to dream – come from the tango Contame una historia of Eladia Blazquez. 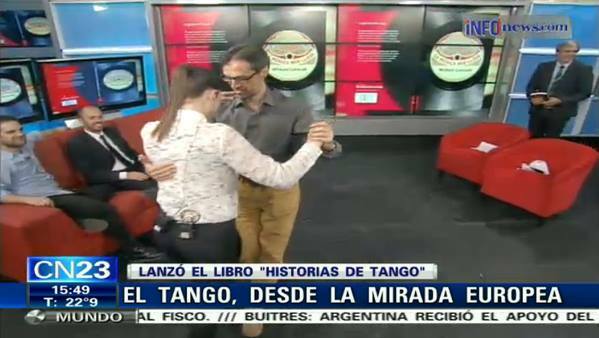 I was asked to come on the Argentine news channel CN23 to talk about the book and my opinions on tango. These guys joked around a lot, but they knew their stuff and asked good questions – what was the first tango that really grabbed me (‘Toda mi vida’ of Troilo / Fiorentino), what did I think about Electrotango (grabs the interest at first, but the rhythm can become monotonous), what was my favourite tango (very difficult – I surprised myself by choosing ‘Sur’). We had a lot of fun – I even danced with co-presenter Vicky Márquez, who had never danced tango before! I can tell you – ella se deja llevar. 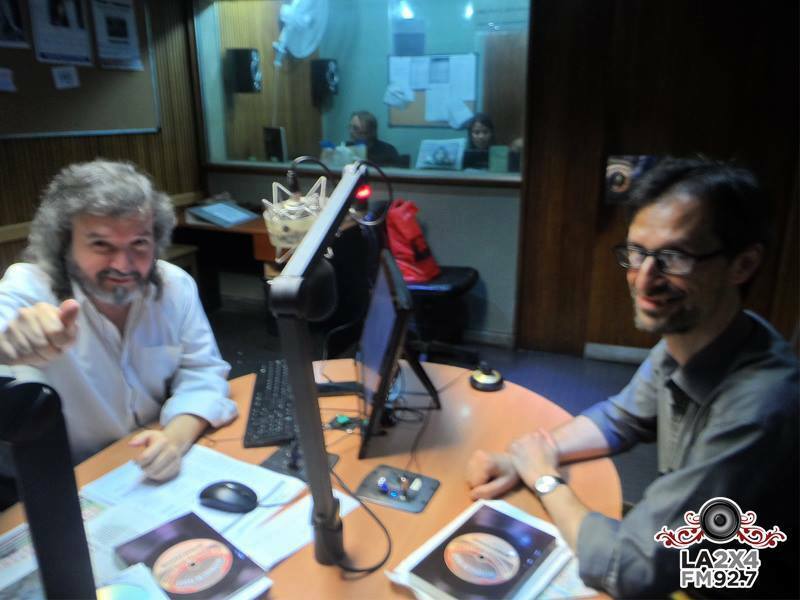 Tango radio station La 2×4 is famous among tango enthusiasts in Argentina, broadcasting on 92.7 FM and also streaming live on the internet. Luis Tarantino kindly invited me on to his show, where we chatted about tango, the book and (of course) football.